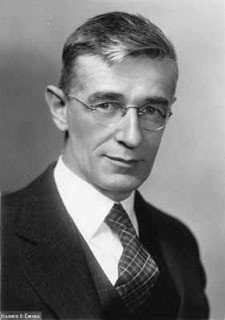 American engineer and inventor Vannevar Bush studied under Arthur E. Kennelly and conducted submarine-detection research for the US Navy during World War I. In 1922 he was one of three co-founders of the American Appliance Company (now Raytheon), an electronics parts supplier. In 1935 he invented one of the earliest devices modern users might recognize as a computer, the differential analyzer, a huge machine capable of solving complex mathematical equations with up to eighteen independent variables. In 1938 he developed the first personal information processor, a device called the rapid selector, capable of high-speed retrieval of information stored on microfilm. He was a scientific advisor to President Franklin D. Roosevelt during World War II, and a key player in the Manhattan Project, the top secret effort to design and built the atomic bomb. His work was seen as proving that science and the military must work together, and he was an adamant advocate for such cooperation, which later came to be called the military-industrial complex. He was named the first Director of the Office of Scientific Research and Development in 1941, and in a 1945 report to Roosevelt, "Science, the Endless Frontier", Bush outlined the need for government support for scientific research, which led to establishment of the National Science Foundation in 1950. He later wrote that he envisioned "a technologically advanced America governed by the masters of science and technology." His 1945 article titled "As We May Think", published in Atlantic Monthly, proposed what he called "the Memex" -- a mechanized, instantaneous system for storage and retrieval of huge volumes and variety of information, similar to what was later called hypertext. Though he was not directly involved in the technical work underpinning creation of the Internet, his students included Claude Shannon and Frederick Terman, and his work was a key influence on hypertext pioneer Ted Nelson. At the headiest days of the Xerox Palo Alto Research Center in the early 1970s, copies of Bush's then 25-year-old article were among the materials distributed to newly-hired engineers. He was named for a friend of his father's, a minister named John Van Nevar, and friends called him "Van." He was not related to the political Bush family. Chelsea, MA, according to some sources.